When you find out you’re expecting twins, you do everything you can to prepare. For me, this consisted of reading everything I could find on twin pregnancies and births. The overwhelming majority of what I read made me incredibly anxious. A twin pregnancy is considered high risk, and I read story after story of women being put on bed rest. Everyone assured me that it wouldn’t happen to me. My doctor was confident that I would make it to 37-38 weeks. My mom reminded me that Theo was 4 days late and weighed 9 pounds at birth. “Your body knows what it’s doing,” she said. 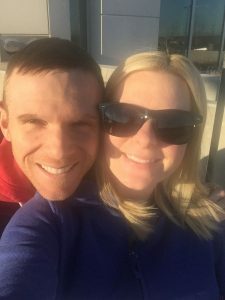 “You can handle this, so just relax.” My fears subsided, and I did my best to enjoy (who are we kidding, survive) my pregnancy. I purchased a twin nursing pillow from a local mom when I was 29 weeks pregnant. “They will be here before you know it!” she told me. “Mine were born at 34 weeks!” “Oh, no, my doctor thinks that I’ll make it to 37 weeks. My first weighed 9 pounds when he was born. My body can handle twins!” I replied. She just smiled knowingly at me as she said goodbye. I kind of wish I could go back in time and tape my very pregnant self’s mouth shut! A week after I assured another twin mom that “my body can handle twins,” my parents visited from out of state for Theo’s Birthday. My to-do list, while they were staying with us, was to pack my hospital bags, just in case! Packing my bags 10 weeks early was way in advance, but rather safe than sorry, right? Ha! Turns out I was too late by just a few days. On Thursday, January 28th, I was lying in bed unable to sleep when I heard a faint ‘pop’ and had the sudden urge to pee. I thought it was odd that I heard a pop, but when I peed, everything was normal. Relieved, I got back into bed only to feel an instant gush of water. We planned on having the girls at the same hospital I delivered Theo at. The one small problem was that this hospital didn’t deliver babies unless they were past 32 weeks. Now, I knew this because I had looked it up. My doctor also mentioned it, and we both brushed it off like ‘oh, no way will they come before 32 weeks!’ In our panicked mindsets, Ben and I completely forgot this tiny, IMPORTANT piece of information, and drove to the wrong hospital. They determined that my water did in fact break, and sent me via ambulance to another hospital (thank you, $300 bill that could have been avoided). When your water breaks before 37 weeks it is called Preterm Premature Rupture of Membranes (PPROM). The doctors informed me that they were going to keep me on hospitalized bed rest for up to 4 weeks. At 34 weeks (if I made it that far), they would induce labor. At that point, the risk of infection would outweigh the risk of prematurity. 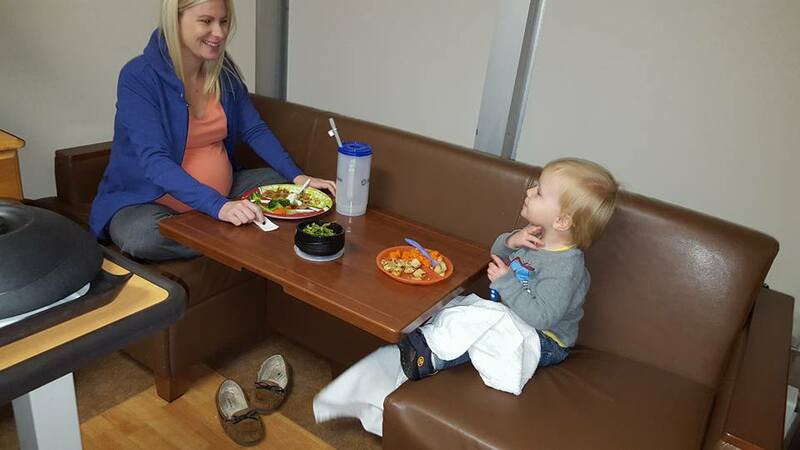 If my body went into labor at any time on its own, they wouldn’t try to stop the labor, as it could mean that I was potentially fighting an infection and it would no longer be safe for me to continue to carry the babies. After 7 days if I hadn’t gone into labor, I most likely wouldn’t, and therefore would be on bedrest for 4 weeks. Some of the details of my initial care were a blur because at this point it was 5:00 or 6:00 Friday morning, and we had been up all night. They gave me two steroid shots to help speed up the babies lung development. I also received a bolus of magnesium sulfate (maybe I received 2 or 3 buloses, I honestly can’t recall). The magnesium sulfate was to prevent bleeds on the babies brains and to stop labor. I had read about magnesium sulfate and knew it was going to be terrible. Nothing I read prepared me for how awful it actually made me feel. I remember crying to Ben that I was so hot I felt as if I was on fire. He got the nurses to bring me fans and cool washcloths, but they didn’t help. I wasn’t actually hot, I just felt as if my skin was on fire, so there was no relief. Do you want to know the worst thing? I couldn’t get out of bed for the first 48 hours I was in the hospital. I couldn’t even get out of bed to pee. 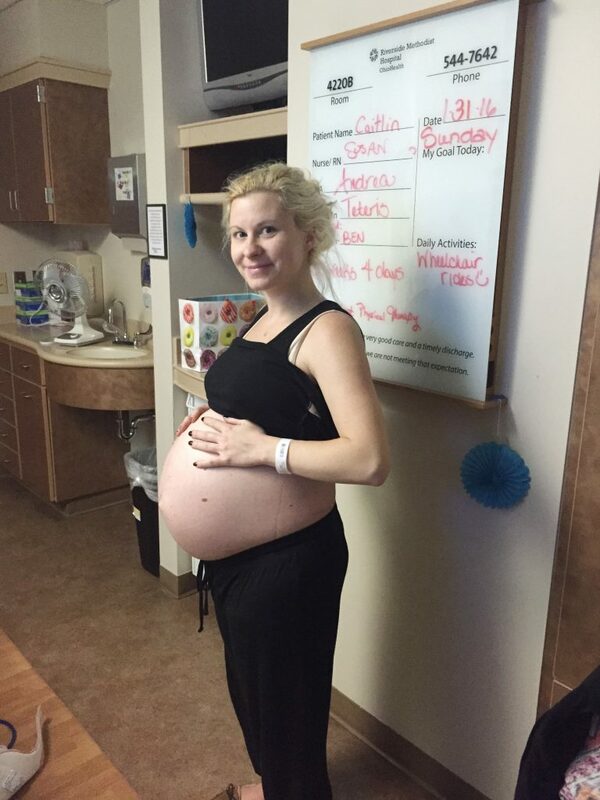 Every time I had to pee, I had to have my husband or a nurse hoist my extremely pregnant body over a bedpan. I couldn’t even reach to wipe! What makes it even worse, is that I couldn’t have a shower, so I felt really gross. The other worst thing (I am allowed to have as many ‘worst things’ as I want) was that there were three monitors strapped to my massive stomach for the first 48 hours. One was to monitor contractions and the other two were on the babies heartbeats. The monitors constantly lost the heartbeats, and every time they did a nurse would come in and poke at my stomach until they got the heartbeat back. I would just be drifting off to sleep (after not sleeping all night) and would be woken up by a nurse adjusting the bands on my monitors. By Sunday, I felt more human and alert and was allowed to get out of bed (no more bedpan!!!). I had a few friends visit, bring me magazines and snacks, and was in relatively good spirits. Ohh, friends. This was the hardest thing in the world. On Monday, Ben went back to work. My parents watched Theo, and although they were supposed to leave mid-week, my mom was going to stay an extra week to make things easier on us. Theo was usually home with me during the day, so finding someone to watch him while Ben was working was a whole new world for us. I tried to remain positive, but it was really hard. During the day I was usually fine, but most nights I would lie awake with such a heavy heart. I missed my little boy and husband SO much. I would lie in bed and look at pictures of Theo and the tears would pour down my face. My mom was so good about bringing Theo to see me just about every day. It was difficult when they visited because Theo had just turned two. He got into everything and had no desire to sit in bed and cuddle with me. He wanted to run around, tear stuff out of the refrigerator, and climb into my shower. The only thing that would keep him entertained was taking wheelchair rides with me, or eating. I belong to an amazing group of twin moms. When my water first broke, I posted in the facebook group to ask for advice, prayers, and any positive support. I was bombarded with stories from women who had been in my shoes, and of how strong and healthy their children ended up. I even had a few moms I had never met come to visit me or send cards! The best thing they did was give me advice on how to survive bedrest. There were secret foods items that the kitchen would make that weren’t on the menu! They also told me that they would give me Ambien to help me sleep- if I asked for it. Heck yes! I was woken up at midnight, and at 6 am to have my vitals taken. I requested a bigger room when one became available, a foam pad for my luxurious mattress, an extra fan for my room, and brought in a humidifier from home to help with the air quality. I never would have thought of these things on my own! 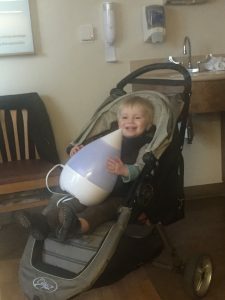 Little Theo carrying in a humidifier for me. The number one suggestion from twin moms who had been in my position was to have some sort of routine. It would have been very easy to lie in bed all day and binge on Netflix, but not good for my spirits. I met with a physical therapist who showed me some exercises I could do with a band so that I didn’t lose all of my muscle tone. I would read in the morning, do my exercises, and then take a nap. In the afternoon I would have lunch, do my exercises again, and watch t.v. or buy things online for the babies. I also had the fetal monitors on for an hour 3 times a day. Some days I had many visitors, and other days I had none. The days I had no visitors were long and depressing. 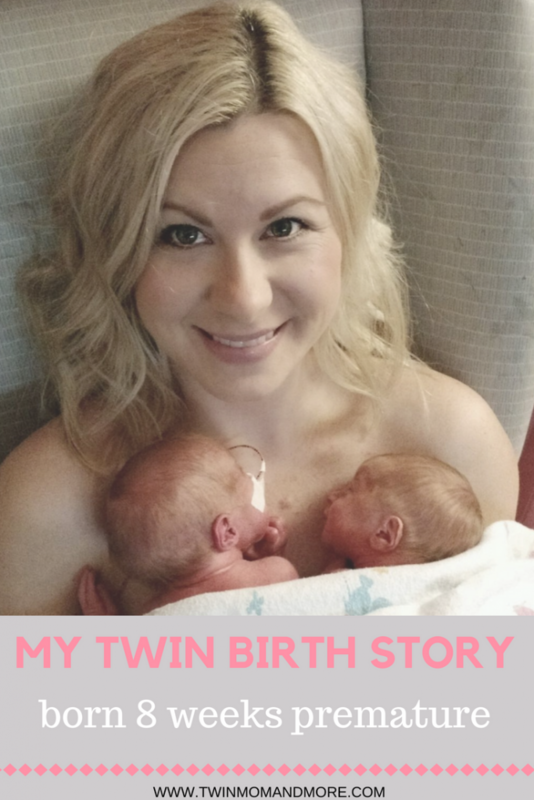 Keep reading my twin birth story, click here for part 2.